First, let me offer a rather blanketed disclosure: (a) I’ve either received or sought funding from anyone with any money who I’ll mention here, (b) the news industry in Philadelphia is small and it is my own, so if I’m not downright friendly, then I have at least had a beer or two with nearly every person mentioned here, (c) 18 months ago, I applied for Budde’s role by way of a conversation with the search firm hired by the foundation, (d) I may likely be involved in some way in these stakeholder conversations and (e) as you’ll see, because I’ve been involved, I’ve written about this for years here, sharing my perspective all along the way. In short, this isn’t an objective news account. This is an airing of thoughts about the subject from someone who has been involved. I do this to come to some conclusions for myself and share, not to angle for a clear objective. Second, you might want to know what exactly happened surrounding Budde’s departure. I don’t know the details. Still, it’s important to me to say that Budde was hired because he is smart, curious, experienced and well-intentioned, with a strong, relevant resume. In my short time knowing him, I also came to find him to be a pretty good guy. We’ve emailed some about this. Knowing media, he and I will cross paths again and I’d like to work with him. Speed: As Budde wrote in his farewell address: “time equals money — much more money than in the initial grant from the William Penn Foundation.” Budde looked at the well-funded TexasTribune model and seemed focused on slowly percolating a staff — nine fulltime at last count, excluding contributors, skewing almost entirely to editorial. There was no urgency for big wins. This seemed a mismatch, to put someone who hadn’t followed this narrative taking on the effort when the context was desperately valuable. Collaboration: He landed some content into the Inquirer and partnered elsewhere, but the learning curve of getting comfortable in a new city seemed to keep him from being able to start connecting dots in innovative ways or even taking a leadership role in the existing news stakeholders. Beyond the few events I invited him to, he and I didn’t chat much. Business: Aside from a fairly junior development hire, Budde spent his money on producing content — which is what any news market in the Internet age is silly with — and very little on cultivating ways to offset those costs. From an interview he gave the Inquirer, it seems clear that he expected the kind of funding and financial support that would allow the effort to have a $1 million annual budget before any other revenue plans were brought on. Focus: Setting aside some good data journalism work by a couple of key hires and the very important, if inevitable, taking over of OpenDataPhilly.org, Axis Philly the editorial product and most certainly Axis Philly the sustainable news effort lacked any clear strategy or focus. Fundamental Philosophy: If there are two broad ways to attack this issue of supporting public affairs journalism — create better news and hope other outlets follow or incentive existing outlets to lead — one can have greater impact faster than the other. Rather than quickly growing or bringing together what already existed, Budde started assembling something new. Likely there had developed very little audience. The world is full of new things but has far too few important things. This too may have been a misalignment of goals between Axis and its funders. In short, from afar, it’s clear there were two very clear sets of expectations. Budde appeared to think he had years to grow and the financial backing to let him do that. Coming from out of town, he may have missed (or not been told about) the sense of urgency from some after four years of discussion. The lack of movement around collaboration, business and focus could be attributed to that lack of urgency. In 2006, prompted by the bankruptcy of the Inquirer, the William Penn Foundation first took a greater interest in the city’s news ecosystem. That included the creation of PlanPhilly, the development news site that covered much of the waterfront revival efforts that the foundation was taking an interest in. In spring 2009, a William Penn-funded consultant began meeting with all manner of media in Philly that had “journalism DNA” to begin the origins of this project. In January 2010, some 40 stakeholders were brought together to hear her recommendations: a hub site with some shared editorial support and a fundraising vehicle. In April 2010, those recommendations were formalized into a report that ushered in a new consulting group that would convene a group of advisory stakeholders to implement the strategy. In October 2010, a series of small grants to incentivize collaborative journalism were released as part of the effort. In December 2010, the William Penn Foundation pledged $2.4 million over three years to go toward the effort, directed toward the newly created Center for Public Interest Journalism, which was designed to incubate the undetermined effort. In February 2011, Philadelphia magazine had the first legacy media look at the initiative. In May 2011, plans to find a leader for the initially named Philadelphia Public Interest News Network were on their way. In February 2012, the foundation announced it had approved the hire of Neil Budde to lead PPINN out of CPIJ. In March 2012, Neil Budde began his role. Updated @ 7/22/13 11:30am: In November 2012, the William Penn Foundation’s board parted ways with its short-lived President Jeremy Nowak, fiery, bright and supportive of Budde and funding journalism. His departure likely had some impact on changing opinion. In December 2012, PPINN rebranded as Axis Philly. In February 2013, Axis Philly officially launched, with its website and editorial staff. In July 2013, Neil Budde’s departure was announced. When foundations don’t want to fund a project, they talk a lot about not wanting to “impact the ecosystem.” That is, at best, a foundation wants to quietly support the improvement of what already exists, not change the market with its deep pockets. Yet for four years, during one of the most active periods of change in the history of peer to peer information distribution, that’s just what has happened. This big project sat and moved and then sat, serving as small talk and gossip fodder among reporters and media types all that time. Because of that itch to finally set sail this journalism ship, there was likely an interest in getting to the next stage more quickly than Budde was working toward. Budde will be replaced — by either another Axis CEO or an entirely different direction (the rumor is that ideas are being pitched from people like longtime Inquirer (and current Axis) columnist Tom Ferrick and former Phillymag and Daily News editor Larry Platt, and the Center for Public Interest Journalism could presumably vie for the whole pot of money to distribute in another way). It’s no small order to axe Axis, with its staff and modest movement, so I’m setting aside the possibility of an entirely new direction or pattern. Instead, I’m operating under the logic that the safer bet here is to try to reorient Axis as it stands now. That said, let’s start with the obvious: there is some sense of damaged goods here. Taking leadership of an organization with a 10-person staff, culture, a brand, a website, an office, web properties, promises and all that comes with existing for a year is very different than starting fresh — or even taking over for an organization that has been fully situated. This may be one of the worst times to take over leadership. The act of finding a new leader this time — either for Axis or for preparing a new direction altogether — would, therefore, be more challenging. Yet, hiring Budde took months and the help of a fancy executive search firm, so one would think it would be hard to swallow such a robust search effort again. So the focus will be to get a stronger vision in a shorter period of time. The hope is that there was learning in the past year, but my fear is that whatever comes next just might be plan B. One thing I’ve learned in covering an early-stage technology community is that if you avoid all the risk, you’re only assuring yourself a slower road to failure. It’s very much a maxim: the reward is always somewhere in the risk. That’s the hard part. WHAT DIRECTION FORWARD DO I SEE? With that in mind, let me do what I have done before and before and before, lay out just what I think now I would like to see be done with Axis Philly. I would hope this would be evident, but let me make it clear: this is a thought exercise. There are details and back story I don’t know that dramatically impact these decisions. It’s a damn tough job — and an important one, enough so that I want more people adding to the conversation. This isn’t meant to rewrite history to besmirch the work of others. I’m not working there. I’m just sharing thoughts as an outsider. Still, rather than the bigger pool of fantasy money dreamed up in the past, let’s take a harder look at finances with some very estimated math. In his closing post, Budde said he started with access to $2 million (the rest of the $2.4 million initial grant went to fund the Center for Public Interest Journalism, through which Axis has been funded by the William Penn Foundation), which was originally aimed at being a three-year grant. He told the Inquirer that $800,000 is left in Axis coffers, which means $1.2 million has either been spent or is still with CPIJ, having not yet distributed (let’s be generous and say the cost of a “well compensated CEO” and other staff who have joined in recent months could have accounted for $750,000, $50,000 in rent and utilities perhaps, $50,000 in their branding and IT costs maybe, say even $50,000 in additional costs, and that still would mean some $250,000 is probably still with CPIJ). CEO/Publisher/Executive Editor ($80,000) — If this person could come in and fundraise mightily, I think it could certainly be closer to the $200,000 in salary as I’ve said before, but that ship has sailed. This time around the CEO will have to be paid (considerably) less to do more. Call it 50 percent vision, 25 percent fundraising, 25 percent programming and editorial strategy. Director of Business Development ($70,000) — The only thing this person is responsible for is bringing money into the organization and thinking about how that will be done in the future, that means grants, advertising, sponsorship, underwriting, ticket sales and the like. This either needs commission or a mission-orientated hire. Call it 50 percent vision and 50 percent sponsor calls and meetings. Sales, Business and Events Manager ($55,000) — This hire puts into action and strategy what this person develops with the CEO and Biz Dev Director. Call it 1/3 percent grant writing, 1/3 percent event logistics, 1/3 percent admin. One of the first additional hires would likely be someone under this hire to be more tactically involved in business processing — invoicing, event logistics, grant writing and the like. Lead Reporter ($40,000) — A reporter excited by data-centric and community evolving investigative journalism. It is absolutely mandatory that the person be on the cutting edge of what it means to be a reporter. Are they following national trends? Do they read Nieman Journalism Lab (thanks!)? Data Specialist ($50,000) — Someone driving data-centric reporting with expansive technical knowledge, interest and spirit. Call it 75 percent data and app dev work and 25 percent outreach training and tech community engagement. IT and data support ($40,000) — Someone additionally working on data-centric reporting, but also filling other IT needs and sparking innovation with younger energy. 50 percent data and apps, 25 percent tech community engagement and 25 percent filling early IT needs. Community Manager ($40,000) — Someone will drive relationships with news and community groups, bloggers, media and the like. Call it 50 percent meetings and events, 25 percent social media, 25 percent apologizing. Event programming ($45,000) — Costs for putting on events, including ones for promotion and also those for revenue. IT and administrative costs ($15,000) — Hosting, software and other technologies. Rent and utilities ($25,000) — Physical space still probably matters, though I’d like some innovation here. Freelance and network budget ($40,000) — For additional reporting and toward impact partnerships. This line item might likely grow the most in future years or be tied into other items. **Additional staff, including reporting and other sales support, could be incorporate through partnership with existing network affiliates. Axis Philly will likely finish 2013 without having made any money, so there needs to be a focus on revenue in 2014. What is it? Like it or not, there’s a brand, staff and movement in one direction, so it’d be tough to dump all of that. So how do we best incorporate that into a broader vision? Goal: Enlarge, engage and educate the civic community of Philadelphia. Keep the Axis Philly name and branding — Money was spent on creating an identity so, like it or not, I’d think a new leader could see value in wasting no more money or time on creating a new public brand. It’s not the name, it’s what you do with it. 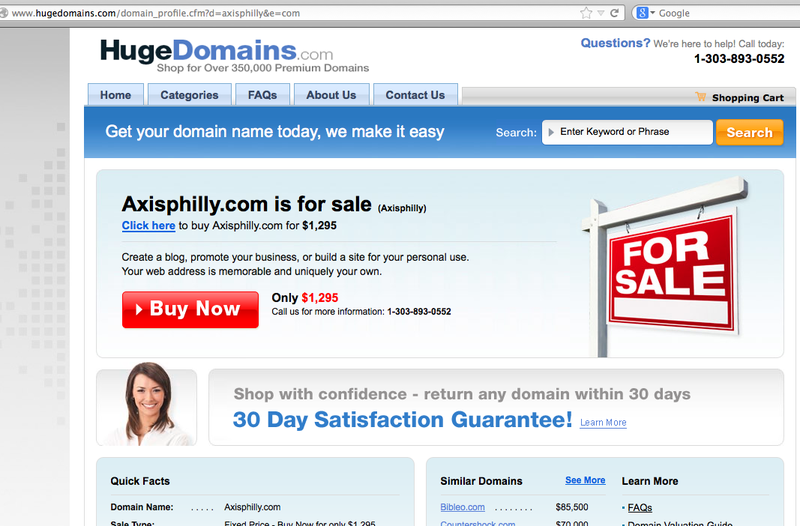 (Although, gosh, I wish someone had also bought AxisPhilly.com, because now it’s selling for $1200). AxisPhilly.org needs a focus — Setting aside the hard-hitting litter coverage, Axis Philly needs a clearer target. That likely means the State Capitol and City Hall, as that’s where people are most often concerned and what intersects the most policy elsewhere. But some time needs to be taken to look at the Harrisburg newsroom and the effort that is already on City Hall. Great pains need to be taken to fill holes, so deeper investigative work may be the ideal. I’d like to see an editorial calendar of big monthly focuses, partnerships with groups like the Committee of Seventy, Pew’s Philadelphia Research Initiative and the like. What kind of audience should go to Axis Philly? Don’t be a news organization, be a civic information resource — That means informing through news when it isn’t being created, sure, but also focusing on building a constituency of actors through events and education, highlighting big issues and moving them forward. Brokering a membership network — It’s a hornet’s nest between WHYY and others, but the effort to bring together various niche and other sites and driving membership that shares perks across the network is another revenue opportunity. Advertising network — Yeah, this still is worth pursuing, though the audience size might be somewhat limited — anyone with traffic that matters, like Philly.com, is likely already doing this. But a mobile and browser-minded advertising network is worth some attention. Shared resources — Data, partnered reporting and sharing audience, IT efforts (hosting, security, etc.) could all be useful to that network. Civic introductions to Philadelphia — With lessons from LEADERSHIP Philadelphia and partnerships aplenty, there is something to hosting classes for newcomers (and interested current residents) on joining civic society of Philadelphia. Ph.ly — Those aforementioned classes could be supplemented by an effort to create culture and understanding about Philadelphia. Think of it like a Kahn Academy for Philadelphia, with videos and lectures and the like, supplemented by the existing URL shortener and email list that exists there now. Philly information app — I’ve criticized the idea of an organization like this needing an app in the future, but one of the clearest ways to get important news and journalism in the hands of more people is to send it to them. I have no consistent push alerts about Philly journalism — some from NBC 10 and for a while I got some from Philly.com, but I want to deliver the strongest content from any and all news outlets. The market is only supporting non-local efforts like Circa and more entertainment-minded Cubed, so this deserves foundation attention. It can avoid duplicating the many other Philly apps from politicians and the city. Community group engagement — Host blogs or educate community groups on reporting on themselves. Young Involved Philadelphia organizes nonprofit board prep, so why isn’t there a community group/zoning board prep expectation? Text blast — For those without smartphone or interest otherwise, get mass text blasts happening about important news and information about communities. This could be part of community group work and learn from other efforts. Celebrate journalism community — Between the Center for Public Interest Journalism and Axis Philly, if these are to be leaders, they should be running efforts like the local ONA (and being involved in bringing ONA national here), celebrating the Pen and Pencil Club, drive collaboration efforts between outlets, foster a media criticism outlet and use the carrot to raise expectations. Information providers of the future — Reporters aren’t only competing with reporters, so it’s time an org like this tries to bring new efforts into the conversation (Remember, what is journalism?). In Philly, what does the city GOP changes and campaign opposition research do for this conversation? Axis Philly needs to look outside traditional media and reporters. Highlight big issues — If Axis has a legislation focus, then education, development, business/economy, art and other big regional topics need to be covered and grown through other efforts (read: partnerships). Speaking of which…. Fiscal agent for development-focused PlanPhilly, historic-preservation-focused Hidden City, education-focused Public School Notebook and similar full-time efforts with mind toward further partnership as they provide the deepest independent niche journalism…. And anyone else who wants in. Relationship with Technically Philly to serve as model for events-based revenue generation. Sure, I’m biased, but I think we have a lot of lessons to share, so I’d want us to be part of this discussion. Clearer and more consistent content dissemination relationships with NewsWorks, Philly.com and the daily newspapers, the TV stations and ethnic media. Pennsylvania Society in Pennsylvania — People have fought for 10 years or more to bring the century-old annual weekend retreat held, ironically, in New York City back to Pennsylvania. It won’t happen — the value is seen as being tourists on neutral ground — but there’s no reason something similar by way of a civility-focused, mainstream weekend retreat to alternate between Philly and Pittsburgh couldn’t happen and additionally be a revenue generator. News coworking — If there is value in physical space for collaboration (there may not be), it could be an opportunity at reviving news coworking as an eventual revenue generator. What’s the future of Walking Around Money? — And could Axis Philly be a part of it? Could we bring together the endless forms of niche news with technology? — There is a lot of information and news and content, but very little context and background. In the long-term would Axis Philly look outside of Philadelphia? — The Knight Foundation has been interested in rural communities and Pennsylvania has them. Work for success in Philadelphia and then look beyond it. What are the metrics for success? In 3-5 years, could more people be voting in Philadelphia because of the work here? Could more people be better informed? What metrics could be tracked for the success of this effort? Create the news engine of the future — Bring together the pieces and the perspective that looks like what can survive, flourish and provide value in a world that features endless content creators and distractions, and a placeless, transient population of wealth and poverty. In all of this, the question of speed comes to mind. The reality is that if nothing happens, the world will go on. The goal here is to speed and strengthen the movement that is afoot. Someone will always report on Philadelphia. But on what and if an audience of influence around action is brought together is another question altogether. This project is four years old, four years that could have been spent building an audience or supporting a network. I hope a new leader or direction can be brought on in the next few months, situated and aimed for an expansion in 2014. Next Next post: What if we instituted *maximum* ages for legislative office?